Jane and Adam’s baby, Billy was now 6 months old. Billy had been sleeping in Jane and Adam’s bedroom since birth but his constant sleep noises had disrupted his parent’s sleep for a long time. Billy’s doctor had said that it was okay for them to move Billy to his own room now. But Jane was still nervous. “What if Billy wakes up in the middle of the night and needs me and I can’t hear him?” Jane said worried. Billy’s room was at the other end of the house and not next to theirs. “Don’t worry, darling. We have the long-range baby monitor and I have tested it out and it works great. We will hear him, don’t worry!” Adam reassured her. He knew it was important for everyone’s sleep and sanity for Billy to make the transition to his own room. And Adam was right. Despite the distance, their baby monitor picked up all of Billy’s cries, even his tiny complaints. And even better news was that Billy eventually learned to settle down in his own room and everyone’s sleep improved. Why Do I Need A Baby Monitor? A baby monitor is one of those devices that you don’t think you need, until you really do. You may have seen the YouTube video recording of the twins that dropped to the ground instantly when they heard their mom’s voice through the baby monitor. Baby monitors are indeed great spying devices! A baby monitor allows you to safely close the bedroom door while your baby naps during the day. If your baby sleeps in a different room, you can hear him or her. Some baby monitors will have video capability which allows you to keep an eye on your child when you are not in the same room. Some baby monitors will allow you to talk to your child without physically entering the room. Some baby monitors have night lights and night vision that make things easier for you if you need to check on your baby in the dark. Some baby monitors have temperature sensors that allow you to monitor the temperature in the room. Some baby monitors have alarms which you can use as a time teaching tool. Some baby monitors come with lullabies to help your child sleep. The analog digital monitor has been around for decades. Baby monitors that use analog waves tend to be a lot cheaper but there is a risk of video and audio transmissions crossing with transmissions from other similar devices. For example, if your neighbor had a device that also used analog signals (such as an analog cordless phone), your baby monitor could potentially pick up their conversations and them, your baby monitor feeds. This obviously compromises your privacy and security. Also, analog baby monitors may suffer from signal interference and normally emit a “sss” sound that sounds a bit like white noise. Digital baby monitors encrypt their transmissions. This means that even though their digital signals could be intercepted, your security is not as easily compromised. Digital signals are also better for long range baby monitors as it stays clearer over a long distance. One potentially huge downside of digital baby monitors (depending on what you believe) is the amount of electromagnetic radiation that it emits. In general, the amount that is emitted from digital baby monitor is much higher than an analog baby monitor. Newer baby monitors now come with DECT technology that uses a frequency that is less prone to interference compared to analog or digital. 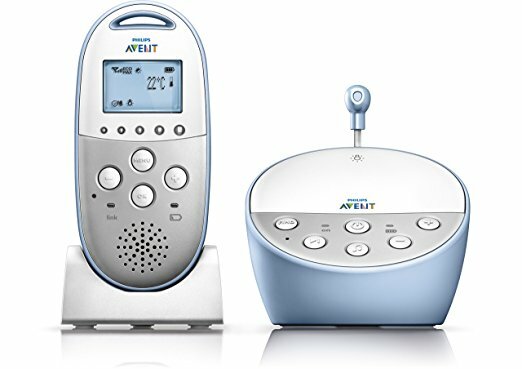 DECT signals allow the unit to only play actual sounds from your baby and leave out other sounds like background fan noises. With DECT, your baby monitor will have crystal-clear sound and video and is unlikely to experience transmission interference. However, like the digital baby monitor, you may have concerns about the amount of electromagnetic radiation that it emits. DECT baby monitors also tend to cost a little bit more. The traditional baby monitor used to be audio only but there are so many more types now. This is the original baby monitor. Such a baby monitor normally comes with a transmitter base (baby unit) that you leave next to your baby to pickup sounds and a receiver unit (parent unit) that you keep with you. Some may even have talkback capability which enables you to communicate with your child through the baby monitor. 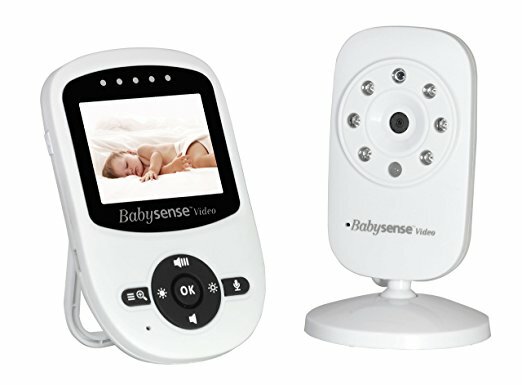 This type of baby monitor transmits both audio and video. 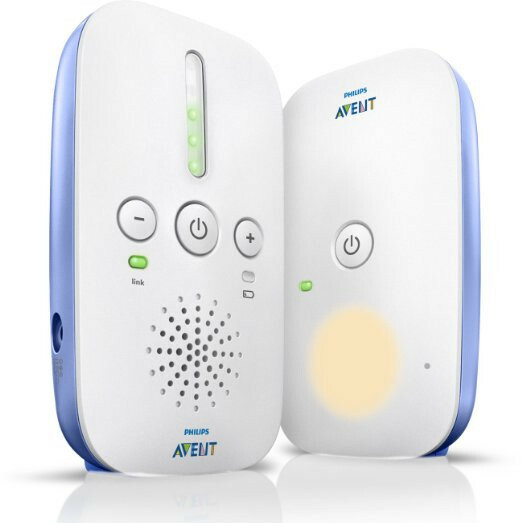 Audio/video baby monitors tend to be more fancy and come with a range of features including temperature sensors, alarms and can work off batteries without the need to be plugged in to work. This third type of baby monitor monitors the movement of your baby (including breathing) and notifies you when baby stops moving for a period of time. This is a newer type of baby monitor and good options on the market are more limited in number. In general, audio baby monitors can work over a longer distance than audio/video and movement baby monitors. The distance range that a baby monitor can work will also be impacted by how many walls there are in your house and how thick they are. On top of range, there are other important functions that you may want to consider when deciding which baby monitor to get. Talk back- enables you to talk to your baby from another room. Temperature sensor- this feature allows you to monitor the temperature in your child’s room. Night light- the baby unit has a night light. Lullabies- plays lullabies when a button is pressed. Noise level indicator- this informs you how loud the noise level is, such as crying. Vibration alert- this feature makes the parent unit of the baby monitor vibrate when sound is detected. Night vision features- this allows your camera to see in the dark. Camera pan and zoom- camera with panning and zooming capability. Adjustable viewing angle- camera can be angled so that you can place it in any part of the room and yet still see your precious child. Durability- your baby monitor should be able to take some rough handling, just in case your baby tries to play with the baby monitor. Battery life- you want a baby monitor that has a longer battery life and is easily chargeable. Battery and plug-in options- You may prefer that your baby monitor can work on either batteries or being plugged in. This just makes it more convenient if you don’t have an outlet to use (for example, if you are camping). Clarity of camera and sound- you want a baby monitor that can consistently pick up sounds clearly with minimal interference and a clear picture if there is video capability. Portability- portable baby monitors are always a good idea since you may want to bring your baby monitor with you while on vacation. Consider the size and weight of the baby monitor units. The list below summarizes some of the best, current audio baby monitors with long range capabilities. We remind you again that the range is measured with no obstructions. 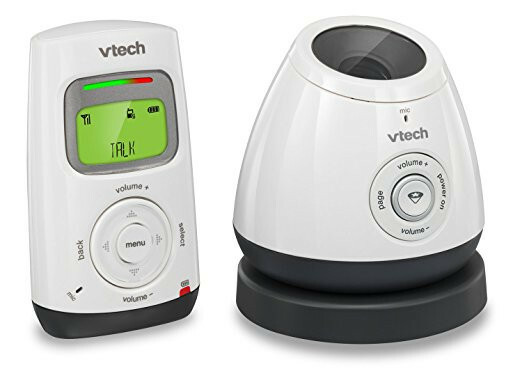 This VTech Audio Baby Monitor can transmit for approximately 1000 feet without obstruction. This baby monitor has a special glow-on ceiling night light that makes this pretty special. It also has a noise level indicator and a talk back function. The price is also decently priced. One downside to this baby monitor is that the baby unit needs to be plugged in at all times which can make things tricky if you are in an area that doesn’t have a power plug. If you are not worried about that, this is a good choice! If you are looking for a basic baby monitor at a great price and does its job of transmitting audio pretty well, this is the one that you are looking for. It doesn’t have a lot of bells and whistles like some of the other audio baby monitors but it works well. 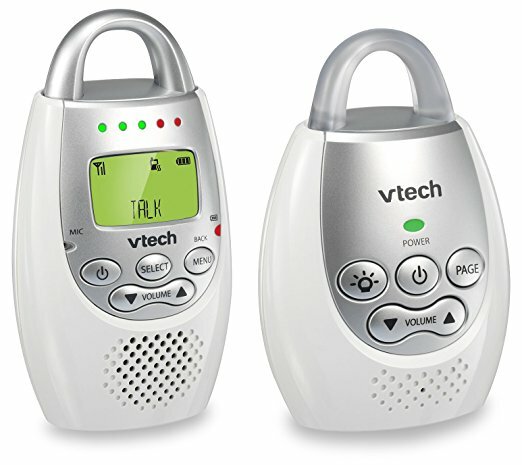 It has the same downside as the other VTech DM222 in that the baby unit has to be plugged in at all times to work. This Philips Baby Monitor is an overall great audio baby monitor. This baby monitor uses DECT technology which means reduced interference, clearer signals and increased security. This unit comes with an alert system that monitors the temperature, plays 5 lullabies and it has a night light too. One concern about this unit is that it only comes with one rechargeable wireless parent unit. This means that the baby unit needs to be plugged in at all times to work. This Graco Digital Monitor boasts an extremely long range of 2000 feet but please be aware that this is only for unobstructed distances. It is a lot less when there are walls in between. This set uses both rechargeable and AAA batteries but it can be used without a plug if necessary. This baby monitor also monitors the temperature and has a night light but it doesn’t play lullabies. This is a more affordable baby monitor that has a range of approximately 900 feet unobstructed. It has a night light, noise level indicator and smart ECO technology for energy-saving options. However, it doesn’t come with the other extra functions like temperature sensors and talk back function. Generally speaking, audio/video baby monitors cannot travel as far as audio baby monitors and will cost more. However, it can be very useful having a camera function so that you can look in on your baby to make sure that everything is fine. This baby monitor is great value. This unit comes with not only camera and audio capabilities that can travel up to 900 feet but it also has a temperature sensor, alarm and plays lullabies! On top of this, the unit will automatically switch to energy-saving mode and the video will turn itself off if there is no noise detected from your child. This gives it a bit more battery life; 12 hours on power-saving mode (audio only) or 8 hours with the video turned on. This is one of the more popular baby monitors on the market. It comes with camera and audio capabilities and transmission can travel for up to 700 feet. It allows you to change the camera lens to suit your viewing needs. For example, if you want a close up view of your sleeping newborn, you can choose a close-up lens. If you want a sweeping panoramic view of the room when your child becomes a toddler and is mobile, then you can change it to a wide-angle lens (sold separately). This baby monitor can also be switched to power-saving mode so that it becomes an audio only baby monitor. One downside is that the battery life only lasts for 6 hours. This means that it is probably going to be a bad idea to use this baby monitor without being plugged in. The good news though is that if you don’t have a power outlet, you can choose to switch the baby monitor to audio only and the battery will then last 10 hours. The Philips AVENT SCD630/37 Video Baby Monitor is a serious contender for great audio/video baby monitors. The range travels up to approximately 900 feet. This baby monitor comes with an alarm, talk back, temperature sensor, lullabies, vibration alert and night light. However, its camera only pans and zooms, it can’t be angled. Another downside is that although the battery of the parent unit can last for approximately 10 hours, the baby unit must be plugged in at all times to work. Movement baby monitors are still relatively new on the market compared to audio only and audio/video baby monitors. We only have one recommendation of a movement baby monitor that can travel a decent range and do a relatively good job. 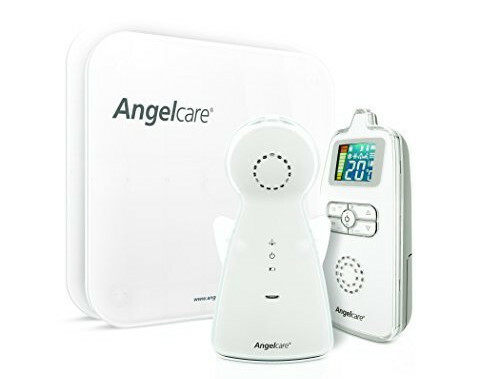 The Angelcare Movement and Sound Monitor can transmit up to approximately 800 feet. This baby monitor utilizes a sensor pad to sense your baby’s movement and if there is no movement detected after 20 seconds, you will hear an alarm. So there you have it, some of the best long range baby monitors on the market, classified according to different types; audio, audio/visual and movement. We hope you found this list helpful. If you have any other favorites, do let us know! At What Age Do Babies Start Crawling?